After game 2 with the series favoring the eighth seeded Los Angeles Kings up two games to zip for the Vancouver Canucks, who had the best record in the regular season in the NHL, I wrote that the Canucks were in serious trouble as anybody would tell you. Now after losing a tight game 3 in Los Angeles, now the Canucks are in serious danger of getting swept, which would only be the second time in Stanley Cup Playoffs history that the one seed would be swept plus the Canucks have the dubious distinction of being the only team ever to have the best record in the regular season and be down in the quarterfinals 3-0. 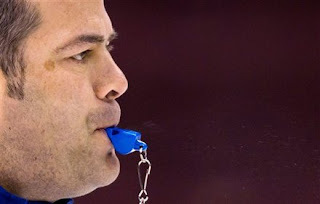 So barring a miraculous comeback where Vancouver rallies to win this series, is head coach Alain Vigneault in danger of getting the ax? UPDATE: Vigneault is safe in Vancouver. If the Kings end up sweeping this series, how embarrassing will that be for this Vancouver club? Teams that win the President's Cup are not supposed to go out in the first round, particularly not in a sweep. Even if the Canucks avoid the sweep, Vigneault has real reason to fear for his job. Vigneault has been a tremendous coach of this club in the regular season; Vancouver has made the playoffs five out of six years under his stewardship and every time they have made the playoffs they have been at least the third seed. But they only advanced past the second round once and that was last year when they fell to the Bruins in the Stanley Cup Finals in seven games. When a team becomes a consistent winner and one of the consistently top teams in the regular season, the expectations rise understandably to win the Cup. Bruce Boudreau was unable to do it in Washington and following a slow start this year he got fired. Going to an NBA example, Mike Brown coached the Cleveland Cavaliers to two consecutive top seeds in the Eastern Conference but was unable to get the team to the Finals and got fired.